What are the most important considerations to make when buying a carpet cleaning machine for commercial use? Anderson Trade, UK-wide supplier of commercial cleaning machines, offers help choosing the right carpet cleaner for your needs. DERBY, England - Oct. 18, 2018 - PRLog -- Vacuuming carpets is a good way to remove loose surface dirt, but what about all that ground-in grime that gets pushed deeper and deeper into the pile every time it's walked on? Not to mention all the airborne pollutants such as dust and chemicals. Carpet cleaners are designed to remove dirt, stains and allergens and are renowned for their deep cleaning properties with a focus on health as well as cleaning. But what should you consider when purchasing a carpet cleaner for commercial use? Here Anderson Trade, trusted nationwide supplier of commercial cleaning machines, offers expert advice on this important investment decision. The first thing to think about says Anderson Trade, is steam power. "Steam is well known for killing off the bacteria that lurks deep in carpet pile. Dust mites and other allergy inducing bugs can be wiped out with steam. What's more, the use of steam rather than water will reduce the drying time needed, which helps prevent mould and mildew from becoming a problem. "One of our most popular models is the Coccinella steam cleaner. It offers professional performance thanks to its continuous dry steam for deep cleaning. There is no pressure cap with this model, which means no waiting for the pressure to drop before you can refill it, unlike with other models." Another important factor to consider according to Anderson Trade, is rinsing ability. "Most carpet cleaners need the help of chemicals to properly attack grime and bacteria. The key thing is to make sure these chemicals are thoroughly removed from the carpet once the cleaning is done, otherwise they could be responsible for inducing allergy symptoms. For this reason, it is vital to choose a carpet cleaner that thoroughly rinses the fibres once they have been washed." It is also important, according to Anderson Trade, to check that the water reservoir is of a suitable size, otherwise it may not be able to handle the area that needs to be covered. "Larger areas need bigger tanks, otherwise you will be travelling backwards and forwards to a water supply over and over again," warns the expert. Next up to check is how simple the machine is to use in practice. Anderson Trade says that this is one of the most important considerations, especially for the user of the machine. "Firstly, check the weight of the carpet cleaner. If you have large areas to cover, is it easily manoeuvrable? Can you lift it up and down stairs? Transport it easily from one contract location to the next? Think also about the length of the power cord and the available attachments. Does the machine offer sufficient flexibility for your specific needs?" It is also important to think about precisely how the carpet cleaner will be used. "Will you need it for the odd spill as well as larger jobs? If so, something that is easy to deploy quickly could be a good choice. For regular ground-in, stubborn stains, you will need a model designed to cope with this specifically. Also look at drying time: some machines will use lower quantities of water, allowing the carpets to dry faster; all important factors to consider." When it comes to product recommendations, Anderson Trade offers a few suggestions. 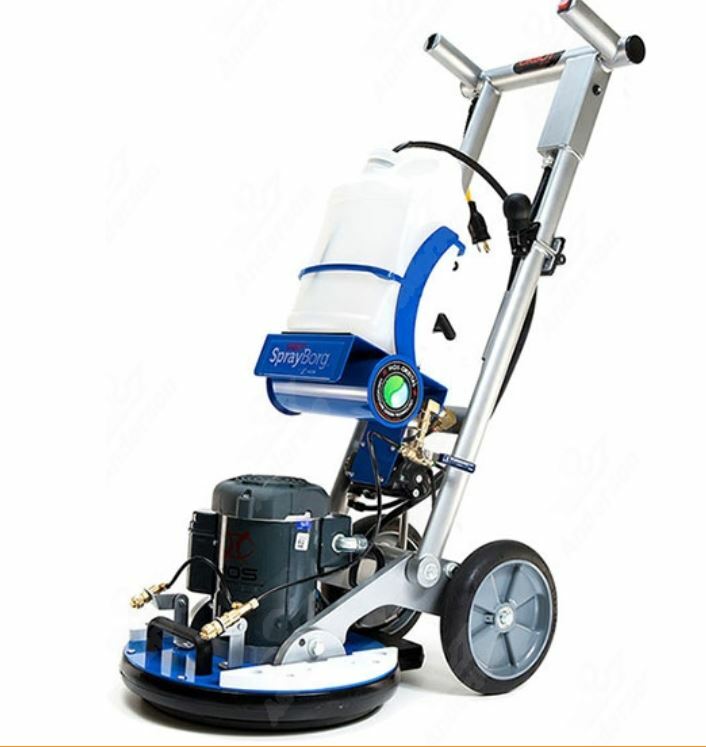 "The HOS Orbot SprayBorg Orbital Cleaning System is a multifunction machine suitable for hard floors and carpets. It uses an encapsulation water based solution, providing deep carpet cleaning using Zorb cotton pads. It uses very little water, leaving the floor virtually dry. It's also easy to transport from floor to floor and up and down stairs. "The Numatic George is the classic all-in-one cleaning machine offering deep cleaning properties for carpets. The powerful motor and pump system make this machine the ideal choice for even the toughest cleaning needs. "And finally, the Vax Commercial VCW-06 offers excellent cleaning power to remove most stains and also lift the pile, leaving the carpet clean and dry. The tool kit allows for easy cleaning of stairs and upholstery." Anderson Trade is a nationwide stockist of a range of commercial carpet cleaners. They offer a free, personalised onsite demonstration, allowing professional cleaners to make certain they select the ideal model to suit their individual needs. Anderson Trade also stocks a comprehensive range of parts and spares for all leading brands of commercial vacuum cleaners. To learn more, visit https://www.anderson-trade.co.uk/carpet-cleaners or call 01332 347 557 for individually tailored advice.